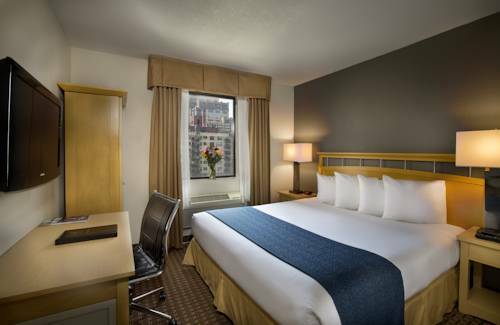 Get more for your money at the Quality Inn Convention Center hotel in Manhattan, NY. We are close to the Jacob K. Javits Convention Center, Grand Central Station, Times Square, Statue of Liberty, Central Park, Rockefeller Center and Madison Square Garden. You can count on amenities like free breakfast, free coffee, free WiFi, a free weekday newspaper and copy, print and fax services. Guest rooms come equipped with coffee makers, TVs, desks, safes, hair dryers, irons and ironing boards. In addition, you can earn rewards through our Choice Privileges program the more you stay. There is no onsite parking; however, there is nearby parking at a charge. - Newark Liberty Int'l Arpt. - Jacob Javitz Convention Ctr. The guy whose face is on the ten dollar bill. The rock was his pillow after he was mortally wounded in a duel by Vice President Aaron Burr in 1804.